Firefly: Fistful of Credits társasjáték - Magyarország társasjáték keresője! A társasjáték érték! A Firefly: Fistful of Credits egy kiváló társasjáték, 2 - 4 játékos részére, az átlagos játékidő rövidebb, csak 30 - 60 perc. A társast, 14 éves kortól ajánljuk kipróbálni. Kooperatív jellegű, a játékmenet erősen épít a forgass és mozgass, a pakli tervezés és a kockadobás mechanizmusokra. Do the job. Get paid. Aim to misbehave. 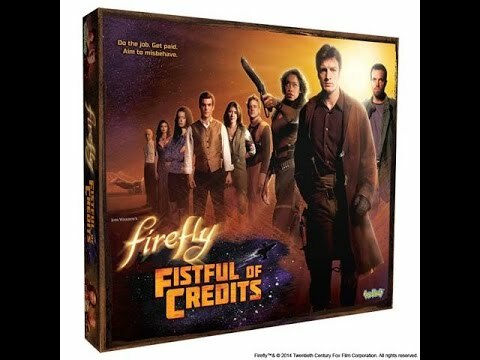 Firefly: Fistful of Credits is a two-to-four-player cooperative game where players step into the boots of Serenity’s crew to pull off a series of dangerous heists and hopefully walk away with their lives and a tidy fortune! The game features three distinct heist scenarios inspired by the episodes Bushwhacked, The Train Job, and Ariel; each with their own highly-detailed board, tokens, and Heist card, which details unique objectives from the show that must be accomplished in order to win. Players pair up any two of the nine crew members, forming unique teams that work with other players to collect gear, fight, and face both luck and misfortune while racing against the clock to complete the heist. Be careful: triggering an alarm, lollygagging around or sticking your nose in the wrong crate can open up a whole world of ugly - be it Reavers, Alliance, or the sinister Hands of Blue! Fail and it’s all over... but succeeding means you and your crew walk away with more than a fistful of credits! The Purge: # 956 Firefly: Fistful of Credits: A great theme, but with a lackluster gameplay....but what does it mean?